Occasional reflections on the wisdom of Ancient Greek and Roman philosophers. More at patreon.com/FigsInWinter. Please consider supporting Stoic Meditations. (cover art by Marek Škrabák; original music by Ian Jolin-Rasmussen, www.jolinras.info). Seneca says that it is natural for us to be virtuous. Modern scientists say that it is natural for us to be prosocial. Either way, it is reason that allows us to expand our instinctive circles of ethical concern. Marcus Aurelius reminds us that we spend far too much time trying to change other people, which is outside of our control, and too little time attempting to improve ourselves, which we certainly have the power to do. Seneca echoes the advice of Musonius Rufus when he says that we don't need to pay for extravagant meals with ingredients brought from all over the world. Every time we sit at the table to eat we have a chance to exercise temperance. Continuing his criticism of the state's war machine, Seneca exhorts us to prosecute our politicians and generals for the crimes they commit in our own name. Seneca writes words about the foolishness of war that were surprisingly modern for his time, and unfortunately very much still pertinent to us today. Seneca tells us something that may appear to be a no-brainer, and yet is difficult to apply: never believe that you can be happy through the unhappiness of another. Cicero reminds us that happiness - meaning our satisfaction with our own life - is guaranteed if we don't hitch it to external events, but only to our own reasoned judgments. Seneca reminds us that it is important to associate with good people. Their goodness is both an inspiration and a guide to make ourselves better human beings. Seneca says that we should remind ourselves of things we know, because all too often we don't pay attention to them. Modern Stoic Larry Becker, building on Seneca, advises us to approach the problems we encounter not one at a time, but within the context of our life treated as a whole dynamic project. Seneca points out that it doesn't matter if there is no continuation of life after death. Just like British comedian Ricky Gervais did recently in his series, aptly entitled "After Life." Epictetus treats anger as an addiction: we should suppress the urge as soon as we begin to feel it, and celebrate the days we have managed to stay away from this temporary madness. Seneca uses the dichotomy of control to get us to move away from our obsession with living longer, and toward paying attention to living better. A good Stoic can be "happy" even on the rack. This phrase happened to be true in the case of the Roman general Marcus Regulus. And his story is worth pondering to see that we can be helpful and find meaning in so many small ways. Seneca says that when negative developments affect our lives, virtue is like the sun behind a cloud: it keeps shining, and eventually dissipates the clouds. Seneca uses the analogy of a scabbard and a sword to remind us that external goods, like wealth or health, are indeed preferable, but only in a limited fashion. What's truly important is the shape of our character. What does it mean to live every day as if it were your last? Marcus Aurelius advises us to live by avoiding both violent emotions and torpor, and by not being a hypocrite. But also, to treat every day as if it were our last. What does that mean? Seneca provides a very clear explanation of the Stoic distinction between virtue and external things, leading to the surprising conclusion that even health is not an unquestionable good. Seneca talks about a major "side effect," so to speak, of the Stoic stance: achieving tranquillity of mind through the development of an attitude of equanimity. Cicero asserts the standard, and apparently paradoxical, Stoic position that virtue is the onyl true good. Let's see why. Seneca says that Nature does not discriminate, it hands out suffering and death to everyone, eventually. But we can still make our life better by developing equanimity toward what we cannot change while trying to change what we can. Epictetus reminds us that character is a matter of habit. Willfully change your habits, and you will be on your way toward becoming a better human being. This episode features our first discussion of Cicero. While not a Stoic (he considered himself an Academic Skeptic), he was sympathetic to Stoic philosophy, and frequently borrowed from it to create his own eclectic blend of moral philosophy. Seneca, building on the Stoic concept of universal causation, reminds us that we don't get to say how the universe works. Our only choices are to accept it (and work within it), or take "the open door," as Epictetus puts it. Can we really improve ourselves? Seneca reminds us that although some people are naturally more virtuous than others, and that much depends on our family upbringing, we are capable of making rational decisions as adults. So make the decision to practice every day to become a better human being. Seneca provides us with one of the best definitions of wisdom. Let's see what it means, and how to apply it to our daily life. Marcus Aurelius exhorts us to not just do it, but slow down, think about it, and then see if we really want to do it. Seneca says it no uncertain terms: it is not wisdom that contrives arms, or walls, or instruments useful in war; nay, her voice is for peace, and she summons all mankind to concord. Seneca summarizes the reasons why to live a good life (the domain of Ethics) one has to learn how to reason well (Logic) and how to better understand the world (Physics). Seneca criticizes the tendency of some philosophers to spend a lot of time trying to develop more careful ways of speaking, at the expense of figuring out more careful ways of living. Seneca says that it causes far too much discomfort to the ears of others to be recognized as a learned person. Better for us and everyone else to be recognized as a good person. Epictetus advises his students, and all of us, to drop our preconceptions and actually open our minds to new notions. Try to practice that the next time you engage in a "conversation" on social media. In a rather forceful passage Seneca makes a strong political statement, referring to Roman imperialism as "sacrilege on a grand scale." Unfortunately, two millennia later, we still honor that sort of sacrilege, which flies in the face of the virtue of justice and the concept of cosmopolitanism. Seneca constructs another logical argument to make the point that wealth is not an intrinsic good. Rather, it is how it is used that can be good or bad. Know any virtuous billionaires, by chance? Seneca builds a simple argument to show that random events, like winning a lottery, are actually not good for you, despite appearances to the contrary. Seneca says that his life's journey taught him that much of what we possess is superfluous, and indeed positively gets in the way of living a good life. He ought to know, as we discuss in this episode. Marcus Aurelius reminds us that all too often we care far too much about the opinions of people we do not actually hold in high esteem. If they judge us badly according to mistaken values, the problem is theirs, not ours. Seneca brings up a parallel between the life of virtue and the art of a sculptor like Phidias. Just like a good sculptor will make the best art that the materials at his disposal permit, so we can be good human beings regardless of the specific circumstances of our lives. Seneca uses a sailing metaphor to remind us that hardship in life, just like a storm at sea, is what truly tests our virtue, as the storm tests the pilot's skills. Seneca dispels the stereotype of Stoics as going through life with a stiff upper lip. Stoic training doesn't insulate us from sufferings. It gives us tools to deal with suffering. Seneca directly takes on the Peripatetics, followers of Aristotle, and criticizes their notion that virtue always lies in the middle. Some things, like insanity, or anger, are not good even in small quantities. Epictetus wonders why people pay attention to outcomes, which are outside of their control, and not so much to planning, which very much is under their control. Seneca draws a beautiful analogy between the harmonious sounds of an orchestra and the harmonious thinking of a well structured mind. Seneca suggests that we should alternate between reading and writing in order to truly understand and internalize new concepts. Which, of course, is yet another way to achieve a major goal of Stoic training: arrive at better and better judgments. Seneca gives this most sensical of advices: read books by others, especially if they disagree with you. Turns out, it's a good way to improve our judgments of things, a major goal of Stoic training. Seneca reminds us that -- although we live in the here and now -- we profit from reflecting on our mistakes, so long as we do not indulge emotionally on them. Regret is not a Stoic value. Learning is. We take a look at one of the most famous metaphors in Stoicism, the notion put forth by Marcus Aurelius that life is a bit like wrestling: we need to be prepared and alert, because the next move may be unexpected. Seneca reminds us that logic is crucial in order to figure out how to live a good life. But logic chopping is actually deleterious to it. Seneca reminds us that there is a difference among the so-called indifferents. Life, health, and education, for instance, are a bit more highly ranked than your favorite gelato flavor. In our 300th episode we look at how Seneca very clearly separates Stoicism (the philosophy) from stoicism (the attitude of going through life with a stiff upper lip). Seneca reminds us that we should interpret other people's actions and words in a generous manner, instead of conjuring the worst possible scenario. It is, after all, the way we would like to be treated. Do you still need somebody to wipe your nose? Epictetus, with his sarcastic sense of humor, reminds a student that he doesn't need to pray to deal with a bad situation. He already has all the tools he needs: courage, fortitude, and endurance. If the Pope or the Dalai Lama say that being good is its own reward, usually people take it at face value. But if a Stoic says it, they demand logical proof. Let's discuss this. Seneca gets to the bottom line of Stoic philosophy: If you wish to set a value on yourself, put away your money, your estates, your honors, and look into your own character. Seneca agrees with Epicurus: fear of death and poverty is crippling, and we need to work toward overcoming it. Seneca reminds us that the tools for becoming a better person are simple and inexpensive. In this episode we discuss the three basic tools of the Stoic practitioner. A quote from Marcus Aurelius sounds a lot like what Ayn Rand would say. But it couldn't be further from it. Seneca reminds us that it may be just as difficult to deal with good fortune as with the bad variety. Regardless, everything life throws at us is an opportunity to exercise our virtue. Seneca says that doing without things for a while renews our appreciation for them. In this episode we examine five exercises in mild self-deprivation guaranteed to reset your hedonic treadmill. Seneca reminds us that courage is not just for the battlefield, but for the everyday difficulties of life, like being sick. A contemporary theory of consciousness, proposed by philosopher Jesse Prinz, recalls Seneca's treatment of the emotions, and teaches us how to avert painful thoughts by focusing on the good things that happen to us. Epictetus reminds us that the only things that are truly good or bad for us are our judgments, which are under our control. It follows that "happiness," in the sense of a life worth living, is also under our control. What's a good reason to endure hardship? Seneca reminds us that athletes willingly subject themselves to harsh regimes in order to succeed. But when it comes to becoming a better person most of us think it's just too difficult. Seneca reminds us that to indulge in regret is irrational, as the past is outside of our control. That doesn't mean we can't learn from it, though. Seneca tells us that our happiness, or lack thereof, is a matter of our own opinion. No, he's not making a relativist or post-modernist argument on the nature of knowledge. The Stoics, the Epicureans, and Aristotle all agreed on one thing: friends are important. In this episode we talk about why, and how the Stoics differ from the other two schools on this topic. Seneca uses a metaphor that later became famous with Shakespeare: life is like a play, so what counts is not its length, but how well we act our parts. Seneca points out that people regret not being alive a thousand years from now, and yet are not bothered by the thought of not having been alive for the past thousand years. Seneca recalls an ancient Roman custom according to which the host of a banquet would distribute gifts to his friends at the end. Consider doing the same after your life has ended. Epictetus warn us that a little knowledge of philosophy, without proper guidance, can actually turn us onto even more stubborn fools than we were before. Seneca argues that life is not like a journey. Whenever it is interrupted it is a whole life, if we have been living it virtuously. Today's quote from Seneca is the root of the modern Stoic technique of premeditatio malorum, a meditation in which we try to get mentally prepared to tackle adversity. Seneca uses a beautiful analogy to argue that some people may look impressive while they aren't, and other people truly are impressive and yet remain overlooked. Seneca tells us that virtue is useful not just in order to handle bad fortune, but also, counter intuitively, to deal with good fortune. We are all going to die, but until then? Marcus Aurelius takes for granted that death is a natural and unavoidable end. The real question is what you are going to do between now and then. Would you buy a car based on its color? Seneca explains that there are certain attributes of things and people that are important, and others that are irrelevant. Somehow, we keep focusing on the irrelevant ones. In this episode we explore a quote from Seneca presenting the Stoic argument for why virtue is the only true good. And if it is, then shouldn't you pursue it above all else? Seneca already understood two millennia ago that there is no such thing as a self-made man, because luck is needed for externals. But not in order to be virtuous. Seneca says that people arrive at wrong judgments about what is valuable or desirable, and a major goal of Stoic training is, accordingly, to make us less unwise about values and desires. Epictetus chastises one of his students for wanting to stick with a decision just because he said he would. Which leads us to a discussion of the roles of reason and emotion. Stoicism is a practical philosophy, but how does that work, exactly? Not very differently from the practice of religions like Christianity and Buddhism. Find out in this episode! Seneca reminds us that the past is not under our control, and neither is the future. Our only locus of action is the present, and that's where our attention should be. Seneca reminds us that those who study philosophy are human beings, subject to the physiological responses and emotions of the case. The difference is in how they reflect on and react to circumstances. Marcus Aurelius reminds us that, when we need to regain serenity, we may retreat into ourselves and recharge our batteries. In this episode, learn about the ruling faculty and its neural correlates. Seneca tells us that virtue can be present at all levels, from nations to individuals, and in all circumstances, from wealth to poverty. Let's find out what, precisely, the Stoics meant by virtue and why it's so important. Seneca reminds us that a life can be virtuous regardless of its length. And since we have no idea how long we are going to live, the question is: what are you going to do between now and then? Seneca warmly invites us to love reason, which will arm us against the greatest hardships. These days, though, reason doesn't have a great reputation. Find out why we should go back to it. Seneca gives a splendidly clear and cogent description of the Stoic concept of preferred "indifferents," external things that are not under our complete control, and which Fortuna can take away at any moment. And off they go, alleging slander! What are you going to do with your luck? Seneca conjures a vivid image of the goddess Fortuna showering mortals with gifts, which are ruined by the eager crowd, or badly used, and that at any rate do not produce happiness. That's because people lack wisdom, necessary to truly enjoy Fortuna's gifts. Seneca explains that if our happiness depends on externals, like fame or money, we are in the hands of Fortuna, who could take those things away at any moment. But if we are happy because we are good, then Fortuna is powerless. Seneca states very clearly that wealth is an indifferent, in Stoic terms. It can be pursued if it allows us to do good, but it should be avoided if it corrupts our moral fiber, making us greedy toward luxury and power. Marcus Aurelius contemplates whether death is a resolution of atoms or a final annihilation. He doesn't seem bothered by either possibility. Seneca warns us against ambition, understood not as the will to accomplish things, but as the pursuit of fame, money, and power. Modern politicians should be like Cato the Younger, not Alcibiades. Seneca says that people are like dogs who eagerly await the next tasty morsel from Fortuna, swallow it quickly, then eagerly await the next one. Don't be like a dog, that way lies perennial dissatisfaction with life. Seneca says that lacking wisdom is like being sick. Although we can imagine what it would be like to be perfectly healthy, in reality we can be happy if we manage to be less sick than before. That's progress, folks! Epictetus reminds us that one does not become a good carpenter, or pilot, by simply studying the theory of carpentry or piloting. Mindful, repeated effort is needed to see results. The same goes with one's philosophy of life. Seneca makes the startling claim that philosophy is a lifelong commitment that cannot be indulged only in our spare time. He doesn't mean academic studies, but rather practice, just like a Christian or Buddhist would do it. Seneca says that he hasn't conquered any enemy but his own greed, ambition, and fear of death. If more people, especially the leaders of the world, were to take that attitude, perhaps there would be no need to conquer enemies. The goal of Stoic training is to become a better person, not a perfect one. But the first step, as always in life, is to want to make progress. If you wish to better yourself, the game is afoot, you need to start now. Seneca provides us with a very short and to the point summary of Stoic philosophy: virtue is the only good, it depends on our ability to reason correctly, and it leads to good judgment. Marcus Aurelius reminds himself to be grateful for the things he has, which he would long for if he didn't have them. At the same time, everything is impermanent, so we should be prepared for our losses. Seneca tells Lucilius that he himself is far from being a wise person, which is as rare as the mythical phoenix. Nevertheless, we can all be "proficientes," those who make progress. Which is the whole point of Stoic training. We hear a lot of nonsense about Stoicism being tough and therefore only for men. But Seneca clearly explains that virtue doesn't make us invulnerable to pain and suffering, and that women are just as capable as men to become virtuous. Go figure. Dining with a tyrant, are you? Seneca gives us another Stoic "paradox": it may be better to be tortured than to sit at the dinner table. Well, not normally, but surely if you are being tortured to protect innocent lives, or sit at dinner with a tyrant. It all depends on context. Epictetus explains why king Antigonus was anxious to meet Zeno, the founder of Stoicism, and not vice versa. The king had not yet internalized the fundamental principle of the dichotomy of control: making a good impression on others is not up to us. A quote from Seneca leads us into a discussion of the difference between Stoicism and modern philosophies of despair. For the Stoic, knowledge of the vastness of time and space is no excuse for nihilism, but simply a way to put things in perspective and get back to the task of living well. Seneca tells Lucilius how Cato, after losing an election, went out to play; and how, before taking his own life, he retired to his room to read a book. Stoicism isn't just about enduring things, it's about achieving serenity in the face of ill fortune. Seneca invites his friend Lucilius to consider that philosophy is too serious a business to be left only to professional philosophers, especially those who engage in clever wordplay and logic chopping just to show how smart they are. Seneca makes an argument for why we should adopt a philosophy of life (be it Stoicism or something else). It provides us a framework to make decisions and prioritize things. The rest is details. Seneca elaborates on how the Stoics see suicide: nature gave us one entrance into life, but many exits. And it is the existence of these exits that guarantees our freedom. Seneca continues his discussion of suicide with his friend Lucilius, arguing that maintaining agency and exercising our judgments are fundamental ingredients of a good life. It follows that we should be in charge of when and how to quit. Seneca makes a point that is still controversial two millennia later. The important thing about life is not its length, but its quality. And it is up to the individual to judge the quality of her own life. Seneca gives some very commonsensical advice, backed up by modern psychological research, on how to best avoid temptation. Which leads us to a discussion of what we should avoid, and what, by contrast, we should seek out in order to act virtuously. Seneca says to his friend Lucilius that he is no wise man or doctor, but rather an unwise and sick person. Which brings us to a discussion of Stoic humility and how it is that we can all make progress toward wisdom. Seneca argues that tranquillity of mind is the result of an active, but realistic, engagement with the problems posed by life. By contrast, refusing to rise up to challenges simply leads to a flat and meaningless calm. Marcus Aurelius reminds us that people do and say things not because they are evil, but because they are mistaken. The proper response, then, is education and pity, not hatred. Musonius Rufus advises us to follow a minimalist life style, closer to the so-called "Cynic" wing of the Stoic movement. Why is that? Because reducing temptations helps us practicing virtue, as we'll see by way of an example featuring gelato. Epictetus says that a lyre player plays beautifully when he practices on his own. But gets very nervous in front of an audience. That's because he wants something that is not under his control. Learn and internalize this lesson and your life will be happy and serene. Seneca argues that the four cardinal virtues are a tightly coordinated council, which makes the best possible decisions for us. In this episode we explore the Stoic concept of the unity of virtue, and make sense of it by analogy with going to the gym to improve our health. Illness is not something to look forward to, as Stoics are not mad. But it is a fact of life, and so it becomes a question of how we deal with it: by kicking and screming, or as a test of our virtue of temperance? Seneca argues that, strange as it may seem, prosperity is to be endured, just as bad times are. It's yet another Stoic "paradox," of which we make sense in this episode. Epictetus tells the story of when he first started preaching, instead of teaching, philosophy. It did not go well, and he got punched on the nose. He quickly learned the difference between preaching and teaching. Seneca recounts the last, painful day, of the life of the rival philosopher Epicurus, who claimed that even that day he was happy. Which leads us into a discussion of what the Stoics and Epicureans meant by happiness. Seneca states the fundamental Stoic principle that the measure of a person has nothing to do with externals like wealth, health or good looks. It depends on one thing and one thing only: goodness of character. Seneca gives a straightforward, simple, yet rich definition of virtue to his friend Lucilius. It has huge consequences for every one of us, every day. Marcus Aurelius says that other people do wrong out of lack of wisdom, and so do we, which means we should be forgiving toward others. Besides, life is short, and others can't harm the most important thing: our faculty of judgment. Epictetus reminds us that Socrates made an effort to talk to people while avoiding rudeness and invectives. Imagine if we did the same today, instead of indulging in the current climate of acrimony about social and political issues. Seneca says that one shouldn't love a person because they are rich, or strong, but because they are virtuous. Which gets us into a discussion of the meaning of the word "axia," referring to things that have value but are not crucial. Seneca says that being rich does not make you a good person, nor does being poor make you a bad one. We then use this quote to explore the relationship between externals and virtue. Seneca says that it is natural to seek joy and avoid pain. But the virtue involved in both cases is the same. In the quote we examine today, then, there are a lot of crucial Stoic concepts to be parsed out. Seneca tells us that virtue lies in how you handle things, both good and bad. If you are sick, be gentle with those who are taking care of you. If you get a promotion, don't brag to your colleagues. It's the virtuous thing to do. Epictetus reminds us that it is senseless to talk to others just in order to score points. That way we don't learn, understand, or persuade; we just puff ourselves up and waste opportunities. Seneca states the classic Stoic view that all virtues are aspects of a single underlying one: wisdom. In this episode we explore what that means in practice, every day. Seneca tells us of one of the well known Stoic paradoxes (i.e., uncommon opinions): it is equally good to be joyful or to endure torture. How can we make sense of this? Find out in this episode. Seneca is at peace with the notion of death, and in this episode we talk about why the Stoic attitude toward this natural process of cosmic recycling makes a lot of sense. Seneca suggests that we should remember and honor the people that have made positive contributions to humanity, and I add that perhaps, conversely, we should get away from modern "celebrity" culture. Seneca is asking for trouble. Well, not exactly. But he reminds us that Stoicism is about constant practice, so we shouldn't just be prepared to meet a challenge, but positively welcome it. Seneca says that we have no idea when Fortuna will take friends and loved ones away from us, so the sensible way to live our lives is to take full advantage of every moment we spend with them. Seneca says that making friends is one way to counter the doings of Fortuna, because having friends is one of the great consolations in life, no matter what happens to us. Marcus Aurelius reflects on the famous concept the Stoics inherited from the pre-Socratic Heraclitus: panta rhei, everything changes. What would happen if we took this seriously, in our everyday life? Epictetus says that if we encounter someone who is lost we don't make fun of him, but give him directions. Why, then, do we engage in sarcasm against people who disagree with us? Musonius Rufus reminds us that self control is a crucial component of the cardinal virtue of temperance. This doesn't mean we cannot enjoy pleasures, only that we need to do it in proper measure. Seneca says that we should greedily enjoy our loved ones, right now. Because we have no idea how long we will enjoy the privilege of their company and affection. Pay attention to the here and now. Stoicism is often accused of counseling to suppress emotions. This quote from Seneca clearly shows it doesn't. Then again, we don't want to wallow in grief and let it paralyze us, because we have duties toward the living. Seneca reminds us that one of the simplest and cheapest of pleasures is to engage in a continuous conversation with the best minds humanity has ever produced. By reading a (good) book. Are you really that busy? Seneca suggests that we should change our attitude toward being busy: don't surrender yourself to your affairs, but loan yourself to them and you will live a happier life. Seneca says that for many people the furnishings of their lives are more than enough, but they keep wanting more, thus dooming themselves to unhappiness and turmoil. Seneca clarifies one of the famous Stoic paradoxes: no, you shouldn't live every day as if it were your last. But you should live every day to the fullest because you don't know which one will be your last. Are you dead before the time, by your own choice? Seneca reminds Lucilius that a full human life is about being useful, and particularly about helping others. Sure, you can withdraw from the world and live in peace, but then you are arguably already dead. Marcus tells us that, regardless of how people around us behave, we should keep following our moral compass, just like an emerald keeps its color regardless of what others are doing. Epictetus engages in a short dialogue with one of his students, asking him a trick question. How would you answer the question of whether pleasure is a good thing, something to be proud of? Musonius Rufus articulates the Stoic equivalent of "no pain, no gain," in part as a rebuke to the Epicureans. Engaging in social and political life is painful, but it's the right thing to do. Seneca is critical of the fact that many ships are required to convey the requisites for a single meal, bringing them from no single sea. Still today so many people indulge in pleasures that cost a lot and cause much environmental damage. Time to revise our priorities about where our food comes from? Let's talk about the ancient Roman goddess Fortuna, or what the Greeks called Tyche, to whom Seneca often refers in his letters to Lucilius. Why does she play such an important role in Stoic philosophy? Seneca argues that we want joy in life, and we want it to last. And yet, we insist in seeking it in all the wrong places, from ephemeral pleasures to the fickle praise of others. Seneca claims that flattery is a subtle enemy of our work toward becoming better persons. Too readily we agree with those who tell us that we are good, sensible, holy even. What's a good attitude toward praise, then? Seneca reminds Lucilius that we can't relegate our quest for becoming better persons to intervals between indulgences. It's like going to the gym: you have to do it regularly and often, or you won't get the benefits. Seneca says that the wise person (and, by extension, the practitioner of Stoicism) will deal with poverty, sorrow, disgrace or pain, because she is alert and fortified, ready to treat adversity as a way to improve her character. Seneca tells Lucilius that old age is natural and to be welcomed. So long as it maintains our mind in working order. If that's not the case, then the Stoics prefer to exit through the open door, as virtue itself becomes impossible to practice. Seneca reminds us that we have some power to make our body last longer, by exercising temperance in our pleasures. Enjoy your next meal, just don't over do it. And remember, Stoics drink wine, but they don't get drunk. Marcus Aurelius reminds us that there is no difference between acting according to nature and according to reason. What did he mean? According to Epictetus philosophy gets started when we are genuinely interested in why people disagree about things. Not in terms of factual matters, which empirical evidence can settle, but about values and how we should think about the world and therefore act in it. Seneca tells Lucilius that he welcomes knowledge from all fields, not just philosophy. That's why he wrote books on natural questions, including on the nature of comets, earthquakes, thunderstorms, and the causes of the flooding of the Nile. Seneca tells Lucilius that we need rest and relaxation, but we can exercise virtue even in our choice of how we relax and entertain ourselves. Consider how you refresh your mind, the next time you pick a movie or organize a vacation! Seneca quotes the Pre-Socratic philosopher Heraclitus to the effect that everything changes all the time, panta rhei. It follows that it is futile to get attached to things, including our own bodies. Enjoy what you have, but consider it a temporary loan from the cosmos. Marcus Aurelius talks about being helpful to society. And yet he was an emperor who waged war and presided over slavery. How do we reconcile his actions with his Stoicism? At least in three ways, explored in this episode. Do you think you know the difference between good and bad? A splendid example of Epictetus' sarcasm by way of a bit of dialogue with one of his students. In the course of which we learn about the virtue of practical wisdom, the discipline of desire, and the dichotomy of control. Seneca nicely explains what a proto-emotion is, and we discuss how proto-emotions can then develop into fully formed healthy or unhealthy emotions. It all comes down to what cognitive judgment we apply to our initial response. Seneca reminds us that real tranquillity comes from a relaxed mind with a clear conscience. Which is why Stoics engage in an evening meditation on the major events of the day, learning from their mistakes, and filing them away before going to sleep. Seneca challenges the common assumption that someone is self-sufficient if he has enough money, a nice place to live, and so forth. True self-sufficiency requires serenity, which comes from inner strength, not from externals. Seneca agrees with Epicurus: death is a state of non-existence, therefore we do not feel anything, and there is nothing to be afraid of. Moreover, it is no different from the aeons before we were born, and we don't regret those, do we? Seneca tells us that philosophy, understood as a way of life, cannot be relegated to spare moments. Just like someone can't be a Christian only on Sunday mornings, so a Stoic applies her principles at every opportunity, big or small. Seneca advices his friend Lucilius to pay attention to people who act right, not just talk right. When we pick a role model to improve our character, let's pick someone whose actions we want to imitate, they are a better guidance to virtue. Seneca argues that we can force Fortuna, the goddess of luck, to deal with us on equal terms, by not being slaves to external things we cannot control. Cultivate equanimity, and Fortuna will play fair with you. Marcus Aurelius gives some commonsensical advice on how to interact with other people, which leads us to a brief discussion of what counts as "Stoic" advice in the first place. Epictetus reminds his students that engaging in a wrong act, even one done in response to an injustice, stains our own character, and therefore hurts us first and foremost. Stoics don't favor retributive justice systems. What's the problem with the passions? Seneca reminds us of the distinction between unhealthy and healthy emotions: being overwhelmed by the first ones tears us apart internally, while cultivating the second ones brings harmony to our psyche. Musonius Rufus, in an implicit rebuttal to the Epicureans, reminds us of all the things that is worth experiencing pain to achieve, most importantly being a good, just, and temperate person. Seneca gives rare advice on one's abode. It should be a place that does not get in the way of practicing virtue, which means neither too uncomfortable (if we can avoid it) nor too luxurious or distracting. Seneca disagrees with Epictetus: the first says that philosophy is a pleasant medicine, the second that it is a painful one. And yet they agree that it is a remedy that, taken regularly, makes for a wholesome life. Is the problem with the place, or with you? Seneca says that more often than we realize we blame our problems on the time and place we live in, without understanding that the fault may be with us, and that we should work on ourselves, instead of finding excuses. Seneca argues that we are born with the ability to reason and to improve our reasoning. We are also naturally social, and prefer virtue over vice. Hard to believe, right? And yet, he's got a point. Seneca argues that it is the quality, not the duration, of one's life that is important, and that we often live long when measured in years, and yet too little in terms of what we accomplish. What's really important in your life? A straightforward quote by Epictetus allows us to reflect on what a philosophy of life is, and why everyone needs one. Seneca says that he'd prefer to be told how to help people, rather than how many different meanings of the word "people" there may be. Life is hard as it is, says Marcus Aurelius, there is no need to make ourselves more miserable by adding unnecessary opinions that increase our suffering. Epictetus introduced a major innovation in Stoic ethics with his theory of roles. We are first and foremost members of the human cosmopolis. But also fathers, mothers, sons, daughters, friends, colleagues. How do we balance the conflicting demands of such diverse roles in life? Seneca reminds us that we can't live happily if we transform everything into a question of our own utility. We must live for your neighbour in order to live for ourselves. What do you think is truly good for you? Marcus provides us three options for what sort of thing is truly good for you, and argues that a person of understanding will go for the third one. Have you reflected on what is good for you, and why? Epictetus advises us to forgo issues of material resources and remember that family relationships in great part define who we are. After all, if we can't practice virtue with our brothers, sisters, and parents, with whom can we practice it? Seneca says that if we are going after the satisfaction of lust, greed, ambition, and so forth, we make ourselves slaves to fortune. Not so if we regard what we have as loans from the universe, which the universe can take back at any moment, by any means. Musonius Rufus reminds us that it is far easier to curb our desire for our neighbor's wife than to pursue it Not to mention that it is the right thing to do. Seneca reminds us that all too often we judge people on the basis of what they wear, or of their social rank, mistakenly assuming that those are good indicators of their character. Seneca reminds his contemporaries that slaves are human beings like everyone else. In this episode, we talk about slavery in the ancient world, what the Stoics thought about it, and what follows from their philosophy. Seneca reminds us that philosophy is open to all, no matter what our background and means. Engage the philosophical life and you will get to converse with noble minds across time and cultures. What does your inner daimon say? Seneca observes our tendency to boast of the good things we do and to keep quiet about the not-so-good ones. As if our own judgment, the judgment of our conscience, didn't matter. How on earth did I get here? Seneca says that Stoic mindfulness is about paying attention to what is happening to us. We need to keep charting and re-charting our way forward, as our mind needs to be prepared for the vagaries of Fortune. Seneca says that Fortune may take just as much, and as suddenly, as she can give. But we can work on improving our character so that we can accept with equanimity both the good and the bad stuff in life. Marcus Aurelius suggests some simple therapy for our troubled souls: pause and observe some good things done by people around you. Appreciate what they are doing. And use it as an inspiration for becoming better yourself. Epictetus warns us that if we let an external take precedence over the integrity of our character we are doomed to become slaves for life. And who wants to be a slave, right? Seneca reminds us that Stoicism is a live philosophy, which must evolve over time in order to incorporate new truths and, if needed, reject old ideas that turned out to be wrong. Marcus Aurelius reminds us that Stoicism is both self forgiving and forgiving of others, and that while we should take the path of truth and justice, we should also be tolerant of people who are even further from wisdom and are gooing the wrong way. Epictetus tells us that nobody can force us to agree to a judgment we think is incorrect. Surprisingly, this has countless applications to everyday life. Seneca reminds us that, regardless of external circumstances, the only life worth living is one of virtue, and the only life to avoid is one dominated by vice. Epictetus reminds us that education, which involves the ability to shape our moral values, is the only ticket to achieving freedom. Something to remember, in these days in which people freely elect tyrants and autocracts. Would the Stoics approve of assisted suicide? In this episode we discuss a quote from Seneca which, together with several other passages in other authors, clearly points to the conclusion that the Stoics were in favor of suicide in the case of disease and frailty in old age. Which does not mean they took suicide lightly at all. Musonius Rufus rather sarcastically reminds us that being bad requires just as much work as being good, so why not choose the latter instead? Marcus Aurelius says that people make mistakes because they don't know better. So there is no point in getting self-rigtheous and angry about it, instead we need to teach them where they go wrong. Go hug a philosopher, will you? Epictetus defends the apparently strange notion that philosophy, like mathematics (or science, or lots of other things) is a profession, requiring expertise. He is not being elitist, he's just being reasonable. Seneca reminds us that even though we belong to different social groups, religions, ethnicities and so forth, we are, most fundamentally, members of the human cosmopolis. Marcus Aurelius reflects on what happens to us when we die: either we are absorbed in the seminal principle of the universe, or we become atoms scattered in the void. Either way, we still need to behave decently toward other human beings. Epictetus asks us a simple question: if we didn’t learn these things in order to demonstrate them in practice, what did we learn them for? Seneca tells Lucilius that moving to the other end of the world will not be helpful if his troubles are generated by his own attitudes, because he will carry the same person around the globe, if he doesn't address the real issue. Marcus Aurelius reminds himself of something that modern politicians need to pay attention to: if someone shows you that you are in error, the right thing to do is to admit it and learn from the other. Epictetus tells the story of a thief stealing his lamp at night, and reflects on what each of them lost in the process. He concludes that he came ahead of the thief. Seneca, with rather uncharacteristic sense of humor, says that one can't buy a sound mind, and even if that were possible, there would be no market for them. Marcus Aurelius suggests we think of others as partners at the gym: don't hate or hold grudges against them, think of them as opportunities to improve your virtue. Epictetus says that the way we improve our character is by paying attention and making good judgments, while if we keep making bad ones we make our character worse. So today reflect carefully on your decisions, and ask yourself what would Epictetus do. Seneca lists the worst things that could happen to him, and that we all fear, and reminds himself that the only truly terrible thing is being a bad person who holds to bad values and makes bad decisions. Musonius Rufus reminds us that we often act out of simple habit, without paying attention to what we are doing and why. Not the best way to proceed in life. Why do you care for the opinion of posterity? Marcus Aurelius observes that some people are obsessed with what posterity will think of them, even though they have no idea what sort of individuals will make that judgment. Meanwhile, how about taking care of those we know here and now? Epictetus says that externals (health, wealth, education, good looks) are the means by which we do good or evil in the world. So it is entirely up to us, really. Seneca reminds Lucilius that we ought to hope for justice, but brace ourselves for injustice. This is just the way the world works, which doesn't absolve us from our responsibility to do something about it. Marcus Aurelius reflects on what is worth doing, and decides that it's not seeking fame, but rather being helpful to fellow human beings. Epictetus says that people cannot assent to what they think is false. We always want to be right, but we are often not, which is why we rationalize things. That's why we need to improve our ability to arrive at correct judgments about things. Seneca introduces a classic Stoic exercise, the premeditatio malorum, thinking about bad things happening, playing them in your head, so you get comfortable with accepting whatever may come. Marcus Aurelius reminds us that all sorts of things will disturb our rational soul, and that we therefore need to practice re-centering it in order to respond to situations with reason and equanimity. Can you tell the difference between the baths and the mill? Epictetus has a little bit of fun with the Skeptics, who denied the possibility of human knowledge. If that's the case, he says, how is it that you reliably go to the thermal baths when you want to relax, and to the mill when you want bread? Seneca observes that some people begin to really live their life only near the end. And some never begin at all. So what's sort of life you want to live, and have you started already? Marcus Aurelius reminds us that whether we are cold or warm, ill-spoken of or praised, and dead or "doing something else," we still have a duty to make this a better world. Where are you going to hide from death? Epictetus uses his dark sense of humor to remind us that death is inevitable. At the same time, though, fear of it is not. Moreover, awareness of death is what, in a sense, gives meaning to our life. Are you on the right path, or do you need a correction? Seneca says that the right path in life consists in a good conscience, honourable purposes, right actions, contempt of luck, and an attitude of equanimity toward whatever the universe throws our way. Marcus Aurelius maintains that if we think and act the right way our life will be an equable flow of happiness. This is because we will do our best, but look at outcomes with equanimity. Epictetus says that philosophy begins with awareness of one's mental fitness. So let's work on that, shall we? Seneca says the problem with pleasure is that if one is too much into it, it rushes us into the abyss of sorrow. So it's time to discuss what pleasure means for a practitioner of Stoicism. If this were you last day, what would you be proud of? Marcus writes near the end of his life about the sort of things he did that he values, from discounting honors and other externals to having been kind even toward people who were not kind to him. Epictetus counsels us to react to insults as if we were a rock, that is, by ignoring them. An insult is only effective if you let it be, and that power resides exclusively in your own faculty of judgment. Rather unusual advise from Seneca to his friend Lucilius: learn how to feel joy. Which doesn't sound Stoic only if one buys into the incorrect stereotype of Stoicism as a practice to suppress emotions. Let's learn how to feel joy, then. Marcus says that we have a duty to do what a social animal capable of reason ought to do. And that's to practice virtue for the betterment of humankind. Tough topic for this episode: what is known as Epictetus' open door policy, that is, the Stoic idea that suicide is permissible, under certain circumstances. And indeed, that it is its possibility that gives us freedom and courage to fight on. Seneca explains that one doesn't have to be an Epicurean in order to find value in the words of Epicurus. It's like in the Senate: you vote for the parts of a motion you approve of, and reject the rest. Marcus Aurelius reminds us that justice is a crucial virtue in Stoicism, and we need to constantly keep it at the forefront. He also says that we need to evaluate our impressions of things, before acting. Don't just do it, stop and think about it first! Epictetus uses a nice metaphor in which the universe is our trainer, sending us tough stuff to deal with so that we get used to breaking a sweat and prepare for the Olympics of life. Musonius Rufus tells us that it isn't enough to know that we should be virtuous, we need to constantly practice virtue. Stoicism is not a magic wand, but it will change your life, and is well worth the effort. Seneca tells Lucilius that it is crucial, from time to time, to engage in exercises of self deprivation, so to prepare ourselves for whenever luck will turn, and also to be grateful and appreciative of what we normally have and may take for granted. 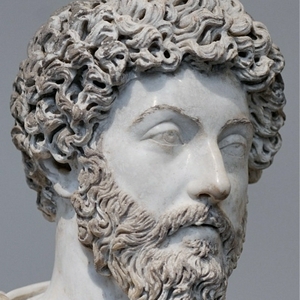 On the day of Marcus Aurelius' birthday, April 26, let's reflect on a simple Stoic precept: good or bad lie in actions, thoughts, and words, not in the praise or blame that those things get from others. Epictetus clearly states one of the fundamental principles of Stoicism: the dichotomy of control. Once we realize that some things are up to us and other things aren't, it follows that we should focus on the first ones and cultivate equanimity toward the latter ones. Are you practicing, or just talking? Seneca says that talk is easy, but the real measure of whether we are making progress lies in our practice. Have our desires for the wrong things decreased? Are we focusing on what is truly important? 15 minutes of fame? Why would you want that? Marcus Aurelius reminds us that fame is ephemeral and intrinsically meaningless. What we do for others and to improve ourselves here and now is what really counts. Epictetus notes that people want to be good, regardless of their ethnicity, citizenship, or religion. But then they get lost in arguments over whether it is acceptable or not to eat pork. Seneca tells Lucilius that one can learn a thing or two even from Epicurus, particularly that it is the company we keep that is the most important part of our meals. Death is coming, what are you doing in the meantime? Marcus Aurelius reminds himself that his life is finite and brief. How to live it, then? As a good person would, which is in his power to do. Whose praise are you so desperately seeking? Epictetus tells his students that they are fools if they think that being praised is important, particularly by people who they themselves do not think highly of! Seneca tells us that anger is a form of temporary madness, not to be indulged by the person who cultivates reason. Do you have reason? Why don't you use it, then? Marcus Aurelius asks himself the rethorical question of whether he has reason, and then the less obvious one of why he is not making good use of it. What about you? Is your mind in the dark, or are you just blind? Epictetus explains why being blind is far less of a problem than having your mind in the dark. Seneca explains the Stoic practice of eating poor and scant food, and going outside dressed with old clothes, in order to remind ourselves that we can cope with difficult situations, and to appreciate anew what we have. Marcus Aurelius reminds himself to use his faculty of judgment at its best, which includes changing his mind, should others have better reasons than his own. Epictetus mocks a student who is bent on pursuing power and wealth. Those things are neither good nor bad for the Stoics, it's a matter of how we use them. Seneca tells Lucilius about two levels of engagement with drunken crodws during the holidays. Good to remember for your next Thanksgiving, Christmans, or whatever you celebrate. Marcus Aurelius says that there is a difference between objective facts and our opinions of them. And much of our misery comes from the opinions, not the facts. Musonius Rufus tells us that theory is important, and needs to precede practice. But it is the latter that makes the whole thing worth it. Epictetus reminds us of the Stoic doctrine that people don't do bad things on purpose, but rather because they are mistaken about the nature of good and evil. Seneca says that whether the universe is controlled by universal laws, by a god, or by chance, we still have to do the right thing. And philosophy is our guide for that. What are you going to do today to improve the human polis? Marcus Aurelius articulates a series of if...then statements that argue that we are all members of a community of reasoners, and that reason dictates that we be helpful to such community. Got a headache? Excellent opportunity to practice endurance! Seneca tells Lucilius that philosophy is not just a way to amuse the mind, but an exercise to guide our actions and mould our souls. Marcus Aurelius here sounds like a Sophist, or a post-modern relativist. But he is a Stoic, so his message is a little more subtle than that. Even when threatened with your life, says Epictetus, you are the one in charge, you make the decision to yield or not to yield. Seneca says that it is incumbent on us to take care of our body, but that we should even be willing to destroy it, if virtue demands it. Marcus reminds us that the number of Facebook likes we get is irrelevant to our happiness. Epictetus reminds his students that without logic there is no serious talking about how to live the life worth living. Seneca says that we often spend an inordinate amount of time worrying about the wrong sorts of things. Musonius Rufus says in no uncertain terms that men and women are capable, and indeed deserve, the same education, including in philosophy. Marcus Aurelius reminds us of one of the most difficult, and yet most profound, doctrines of Stoicism: nobody commits wrongs on purpose, but only because they lack understanding of good and evil. Epictetus argues that the only way to criticize reason is by way of applying reason. There are no alternative facts for the Stoics. Seneca explains to his friend Lucilius why on earth he approvingly quotes one of the Stoics' main rivals, Epicurus. Marcus Aurelius reminds himself that he can always retreat into what Pierre Hadot famously referred to as the Inner Citadel, our own mind, where we can pay attention to and refine our faculty of judgment. Epictetus cautions us to be patient while working on improving our character. Nothing important comes into being overnight. Seneca tells Lucilius to pay attention to the joys of old age, and to be grateful for every day we live. Marcus Aurelius engages in a view from above meditation, reminding himself that the quest for fame is just plain irrational. Epictetus reminds us that when we face an impression about an external thing we should consider carefully whether to assent to it, withhold assent, or remain neutral. Seneca advises Lucilius to choose a good role model to improve his character, for we cannot straighten what is crooked unless we use a ruler. Musonius Rufus says that philosophy is like medicine: if it does not make you a healthier person, it is not useful. Epictetus reminds people with power that they should remember whom they have power over: fellow human beings, made of the same stuff, wanting the same things. The wise person, according to Seneca, needs others to live her life, but not to live a life worth living. For that, all she needs is to keep her faculty of judgment in good order. Marcus Aurelius reminds us that we need to work for the public good, not pursue power, fame, or pleasure. Seneca says that it makes no difference whether your house has a roof of gold, what matters is the character of the person who lives there. Marcus Aurelius says that we need to stand erect of our own accord, not wait to be propped up by others. Epictetus on the fact that it isn't exile, pain or death that determine our actions, but our opinions of those things. Seneca warns us that the path to virtue is easily disrupted by exposing ourselves to temptation and unsavory company. Hierocles instructs us on a simple mental exercise to practice the Stoic concept of cosmopolitanism. Musonius Rufus reminds us why we study philosophy, a different pursuit from what goes on in the modern academy. Marcus Aurelius reminds us that to care for all people is according to (human) nature. Epictetus tells us that Socrates never replied to the question "where are you from?" with "I am from Athens," but always with "I am a citizen of the world." Seneca makes the surprising (to some) statement that Stoicism is all about community and sharing. Marcus Aurelius tells us to ignore the opinion that others have of us, and to focus our energy instead on positive projects. Epictetus says that the measure of a person is the goodness of her character. Let's work on it, then! Marcus Aurelius sounds agnostic about the after life. He also seems to think it doesn't matter. Seneca has a problem with people who measure their worth by fashion or wealth. Hierocles reminds us that it is useless to blame things that have no fault. Rather, look at how clumsy or stupid we are sometimes when we use them. Musonius Rufus says women have the same reasoning abilities as man, the same faculty of distinguishing good from bad. Marcus Aurelius lists a number of important people who are no more, as a reminder of the impermanence of things, and to help us keep what happens to us in perspective. What good did you do today? Epictetus says that not doing awful things isn’t enough, it’s too lazy. The point is to positively do good things. Seneca uses a beautiful analogy to explain why the Stoic practitioner should not rely on luck, and indeed should be positively weary of it. Marcus Aurelius talks about how we should keep our “daimon,” i.e., our deliberating faculty, or our conscience. Epictetus reminds us that sometimes the reasonable thing to do is to suspend judgment. And always to face reality rather than engage in wishful thinking. What counts as a good life? Seneca says that the important thing is not how long a life you live, but what you do with it. Marcus Aurelius thinks that it’s good to keep things in perspective, and that we only control the here and now. Epictetus reminds his student that certain things are an inevitable feature of the universe, and that it is better to work on them than just wish them away. Seneca uses Epicurus’ argument for why we should not be afraid of death, focusing instead on how to best live our life. What makes your life worth it? Marcus Aurelius introduces us to the apparently paradoxical notion that life, death, honor, dishonor, pleasure and pain are neither good nor bad. Epictetus makes an interesting contrast between taking too much care of our bodies and too little care of our minds. Seneca advises us on how to behave with true friends, and reminds us of how important they are in our life. Hierocles reminds us that we are fundamentally social animals, and that we are here to help each other. Musonius Rufus says that nobody is born a writer, musician, or athlete. People get there by studying and practicing. The same goes for virtue. Marcus tells us that it’s too easy and unnecessary to worry about other people’s thoughts. It is far more difficult, but useful, to worry about our own. Epictetus says that some people hardens their opinions into stones. It’s their problem, don’t waste your time arguing with them. Seneca tells Lucilius that wealth should be limited, something that exposed him to charges of hypocrisy. Regardless, what is the relationship between wealth and virtue? Marcus reminds us that our life is short, and that we don’t really know what day will be our last. So why not use our time in the best possible way? Epictetus says that we become virtuous in the same way as athletes and musicians become more proficient at what they do: by constant practice. Seneca wanders into Epicurean territory, as a scout, not a traitor. Marcus is summarizing here some of the most important concepts of Stoicism, especially why we should pity, and not get upset with, people when they make mistakes. Hierocles reminds us how to best respond to another human being who has ill feelings toward us. Musonius Rufus says that philosophers should speak clearly, and most of all should live the way they talk. Don’t sell your soul cheap! Epictetus asks us at what price we are willing to sell our soul, and advises us to aim for the highest one possible. Seneca reminds us that reading is serious business, and that time is limited. Choose well the authors in whose company you wish to spend time. Marcus reminds us that we have duties toward the people we live with, and how to be positive about our friends. The second century Stoic Hierocles sounds very Christian, and for good reasons. This could be the last day of your life. Are you going to waste it by binging on a mediocre television show? Is the wise person self sufficient? Seneca puts forth a paradox: the wise person is self-sufficient, and yet she desires friends and neighbors. How is this possible? Epictetus notes that we can do a lot more with our mind than with our body. And yet we obsess over the latter and care little for the former. The emperor-philosopher tells us that there is no profit for our character in doing things that require lying, being hypocritical, or otherwise damage our integrity. Time to die or to go lunch? Seneca tells us that time is a precious commodity, and one that, once loaned, can never be paid back. Musonius Rufus reminds us of the difference between useful philosophy and dull mind games. Epictetus reminds us of the wisdom of understanding what is and is not under our control. Marcus Aurelius reminds us that it is a strange thing to get offended by what people say or do. Epictetus teaches us what is truly good in life. Marcus Aurelius is thankful to his grandfather and his mother.